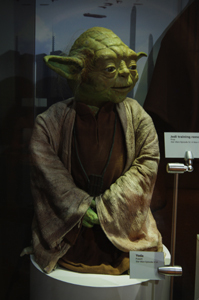 View an original Yoda puppet, Princess Leia’s costume, and numerous lightsabers among the more than 80 costumes, models and props from the movies that took us traveling through space with Darth Vader, Obi-Wan-Kenobi, C-3PO, and Luke Skywalker. Examine Luke’s original Landspeeder and then sit inside a hovercraft and feel like you’re floating in air. Explore our own galaxy inside a replica of the Millennium Falcon’s cockpit. Meet C-3PO and R2-D2, examine robots used in today’s world, and then try your hand at designing and manipulating your own androids. These hands-on, interactive activities focusing on transportation and robots are part of the 8,500 square foot exhibit, the largest ever at Exploration Place. And beware, you might even encounter Darth Vader or a Stormtrooper during your visit as several costumed characters bring the exhibit to life most weekends. After exploring the future, step back in time across the river at the Keeper of the Plains. This 44-foot tall steel sculpture stands where the Big and Little Arkansas rivers join, sacred ground to Native Americans. The Indian warrior sculpture was created by Wichitan and Native American artist Blackbear Bosin in celebration of the nation’s bicentennial. A newer plaza area features displays describing the Plains Indian way of life and plantings of native grasses. The “Ring of Fire” - fire drums on boulders - burns for 15 minutes at 9 p.m. each night in the summer, depending on weather and river conditions. Will you travel to Wichita to see the Star Wars exhibit? What else will you do while you&apos;re in town? *Each Star Wars photo: ©2012 Lucasfilm Ltd. & TM. All Rights Reserved. Used Under Authorization.